Kartik Swami Darshan is an important annual ritual held on the full moon day or Purnima in Kartik Month (October – November) in temples dedicated to Kartik – son of Shiva - in Maharashtra. Special rituals are observed on the day in temples dedicated to Kartik in Maharashtra. Kartik Swami Darshan 2019 date is November 12. It is widely believed in this region by some Hindu communities that one should have darshan of Kartik only on the Kartik Purnima day. Marathi Hindu women have darshan of Kartik only on this day. Women devotees believe that having darshan of Kartik Swami on the day will help in having a long and prosperous married life. Darshan on any other day will bring calamity in the family. Legend has it that if you seek Lord Kartik's blessing on Kartik Poornima day, your husband will have a long life. But if you pray on any other day of the year to Lord Kartik, you will suffer widowhood for the next seven births. It is said that Kartik remained unmarried because he said that the girl Goddess Parvati found for him was just like herself and he did not want to marry someone like his mother. (It must be noted that Kartik is not married as per Marathi tradition but in South India Karthik is married and his consorts are Devasena and Valli). Devotees carry feathers of peacock on the day to and from temples of Kartik. Peacock is the vehicle or vahana of Kartik. 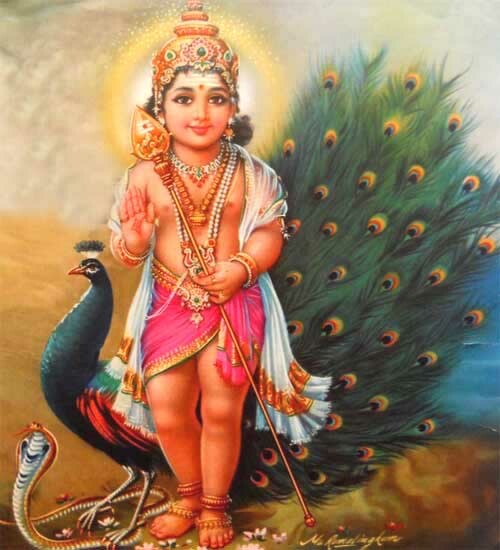 Kartik, or Kartikeya, is the commander of the army of Gods. He is popularly worshipped as Muruga, or Shanmugha or Skanda in South India. Special processions are held in Kartik Swamy temples on the day. One of the important darshan procession takes place at Rajapur near Ratnagiri in Maharashtra.